"I have the greatest respect for what Deirdre O'Donnell is doing at The School of Jewellery Ireland. Basic skills, well taught, are the cornerstone of good jewellery making and there is no quick fix. Really good skills are harder to acquire. What Deirdre is doing is great for the trade and for those that want to learn with a real depth of ability. "- Jane Huston - DCCOI Jewellery & Skills Course Tutor for 14 years. “Brilliant work, so important to teach these skills and so rewarding for both sides… if only there were more Deirdres. So good to see, I have such admiration for what you are doing.” Theo Fennell - Society Jeweller London. 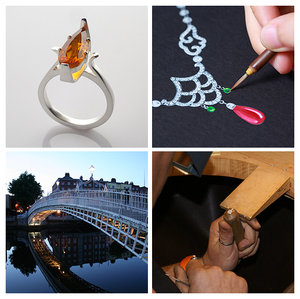 The School of Jewellery Ireland is a Traditional Jewellery School set in the heart of Dublin City. Our internationally renowned courses are recommended by the Design & Crafts Council of Ireland and teach Full-Time, Part-Time, Summer Week, Weekend and one day Jewellery Courses. The Skills provided include Part Time Traditional Jewellery Skills (Goldsmith Skills), Silversmith Skills, Design, Business, Gemstone Setting, Engraving, CAD, Polishing, Wax Carving for Casting and associated skills. Our 'Make your own Wedding / Friendship Ring' Course is extremely popular, fun and rewarding. Our Full Time Certificate in Traditional Jewellery and Goldsmith Skills, which we offer annually, enroling each September, receives worldwide applications and enrolements.